Health Channels Innovators, Inc. (HCII) is a dynamic, young and fast growing Filipino company formed exclusively to explore the opportunities in the vast consumer segments of the Philippine healthcare industry and consumer groups as a whole. We are a company engaged in the health, wellness, and beauty business with major focus on sourcing, development, and distribution of world-class products and solutions. HCII is a very strong brand focused company and it is seeking to establish its brands in key therapeutic segments and institutions. HCII produces its products through world class toll manufacturers like Hizon Laboratories , Seigranz Chemworks, Rohi Rapha, and Silverstar. It is also explores opportunities to import unique health and beauty products to be marketed locally and internationally. Sales and marketing has a nationwide scope, aided by a trained field force of Account Managers and Sales Officers. The company’s objective is to bring a fresh and aggressive approach to consumer and ethical marketing by distribution of unique and top of the line health products and solutions to various consumer segments. HCII was incorporated in August 5, 2008 and had since been focused on nationwide market segments of Metro Manila, Luzon, Visayas and Mindanao. Currently it has a nationwide sales force in charge of sales, medical, and institutional sales and marketing activities. It has a customer service section in the head office which manages phone-in customer queries, order processing, and other concerns. It is likewise equipped with a logistics section to handle inventory and distribution management. To be a respectable, trusted, and dominant player in the Philippines and neighboring countries serving the needs of the market where it decides to participate in, by providing world class health, wellness and beauty products and solutions. P – Professionalism. Doing things in accordance with company-defined standards. I – Integrity. Doing the right things especially when no one is looking. E – Excellence. Performance beyond standards. M – Malasakit. Filipino term for caring for the company as if it was your own. TREVOCA is classified by the FDA as a dietary supplement and registered under FDA reg.no. FR-31649. Trevoca is a balanced formulation of vitamins, minerals, anti-oxidants, and bio-active herbs based on the Philippine RENI (Recommended Energy & Nutrients Intake) formulation. This product is recommended to be taken orally once daily by adults to maintain excellent health. 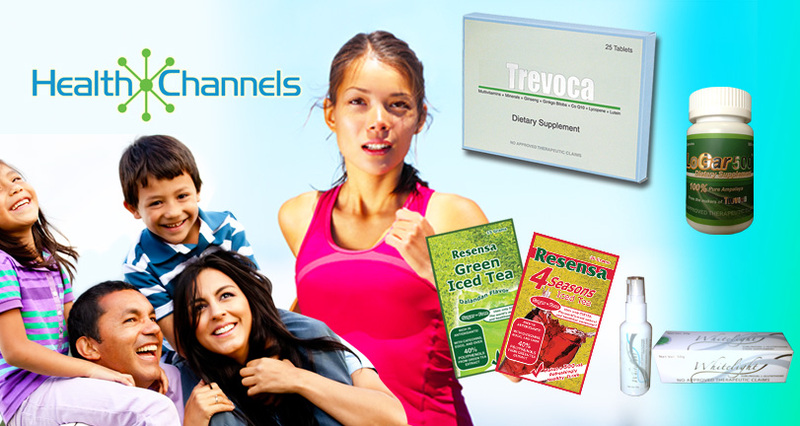 Trevoca is a premium dietary supplement launched in 2000 as a multi-level networking (MLM) product. It was shifted from an MLM operation into a Direct Selling Product in 2005. TREVOCA IS AN EXCELLENT EXAMPLE OF A PREMIUM PRODUCT that is being sold at a very reasonable price. For several years now, TREVOCA has been distributed through popular chain drugstores like Mercury Drug, Watsons, Southstar, Rose Pharmacy, and other reputable trade channels. These trade channels have a combined total of more than 2,500 outlets situated in key locations all over the Philippines. Trevoca is manufactured by Hizon Laboratories Inc., a top pharmaceutical toll manufacturer in the Philippines operating for over 100 years. RESENSA is a premium green tea powder mix drink. Launched in 2002 as an MLM product, it was also converted into a Direct Selling Product in 2005. It boasts of high EGCG, polyphenol, and catechin content of up to 43%, the highest among green tea drinks in the country. Institutions like restaurants, hotels, call centers, and others have served Resensa green iced tea as a refreshingly healthy drink. Resensa is manufactured by Silver Star Resources Co. Inc., one of the highly reputed food companies in the Philippines today. LOGAR 500 is a 100% bitter gourd (Ampalaya) supplement in capsule format, aimed at maintaining excellent health by way of lowering cholesterol and blood sugar levels; boosting the immune system; promoting good digestion; protecting the body from various diseases and infections. It is likewise an excellent source of vitamins, minerals, and antioxidants. WHITELIGHT is another premium product and is the first sublingual glutathione product in Asia. It is being distributed by an international MLM company known as AIM Global, Inc. It is a leader in the glutathione industry in the Philippines and is now making headway in Singapore, Taiwan, HK, Nigeria and soon in the UAE, Saudi Arabia, and the USA. HCII products are being distributed through trade channels like Mercury Drug, Watsons, Southstar Drug, Rose Pharmacy, Aim Global, St. Joseph Drugstore, RBC-MDC Corporation and, other distribution channels which include independent distributors and other institutional accounts. Health Channels is a young company of dynamic individuals who are determined to bring a fresh approach to consumer and ethical marketing. It draws considerable strength from synergizing the diversified capabilities of each of the individuals that comprise its organization. We have a dedicated management team that is qualified and with long and diverse experience in industries such as Pharmaceuticals, Banking and Finance, Customer Service, Logistics, and Information Technology.